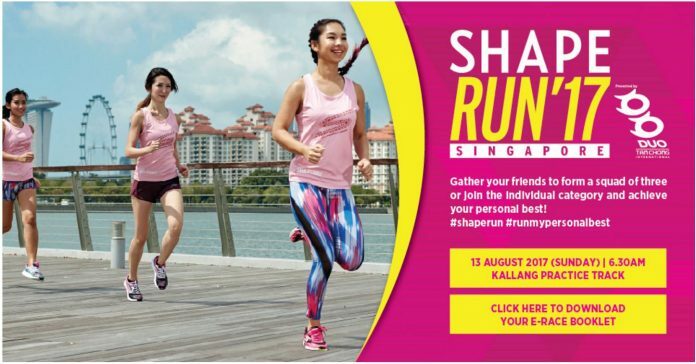 Race Review: Shape Run 2017 [10 km] (by Jilian) | JustRunLah! Today is my last run before my school starts tomorrow and I’m feeling particularly excited. The weather was cooling after the slight drizzle and it seemed perfect for a morning run. I arrived at the carnival early and went to walk around. Entered the start pen when the marshal made the announcement. A short warm-up session was led by the instructors of True Fitness before the flag off. The wait for the flag off was not long and I truly appreciate that. The race road is rather scenic as we run up the Nicoll Highway, towards The Concourse and back past Suntec City. I don’t remember experiencing any bottle necks throughout the race and there were ample space to cater to both slow and fast runners. The reminders by the organizers for slower runners to keep to the left worked and the running experience was pleasant, at least for me. There were also ample hydration points along the route and I know I am falling in love with the lemon water they provide as hydration. It tastes so good! Seriously, you should try it chilled if you haven’t. I preferred the lemon flavour over the orange one. With each hydration point were 2 portable toilets which I felt was really good of the organizers to think of that since there are almost no toilets along the way. It will be convenient for the volunteers too. There was no jam at the finishing line where I queued for my medal and drink (YES to lemon water again!). Overall the race was well-organized and I am glad that I signed up for this race. Although big part of the reason was that their race singlet came in a pretty pink colour.